Stellarium lets you control time. Learning to do Physical Astronomy? Stellarium is the perfect tool for you. It helps you learn to see patterns in the sky. In this article you will learn how to use the Time Control features of Stellarium. You can use the excellent time controllers to move the clock backward and forward. You can speed up time into a time-lapse, slow it down, or move it backward. You can pause time with Stellarium (hint: press the k key to start and stop time). You can jump to any moment in time – even back to the time of the Egyptian Pharaohs. You can jump by an hour, day, or week. You can use it to plan viewings or to check what you saw in the sky. Time controllers give you control over time. You can stop time, speed it up, and go in reverse. And if you find you are stuck somewhere in the past or the future you can easily get home! Speed up time just a little bit (hit the L key a few times or click the double-right arrows) and you will immediately see the stars begin to move across the sky. Notice which direction they are moving? They “Rise” in the East and “Set” in the West – just like the Sun – in fact, every star is like a setting sun. You can click the button on screen or use a key press. Timelapse is cool – but sometimes you want to jump a specific amount of time forward or backward. For instance, you might ask yourself “what will the moon look like and where will it be at this time tomorrow?” The plus and minus keys can help you see that. Often you will want to look at a particular patch of sky and watch it go by, but other times you will want to “lock” onto an object and follow it, keeping it in the view. The Moon is a great object to lock to and track. The Sun is also a good target to lock onto. C-ombine locking with time-lapse and you will really begin to unlock the motions of the sky. Space bar is a control for locking your view on a certain object. Just click the object and hit the space bar. All time controls will still work, but now the view will track that object. Stellarium gives you a super zoom ability and can make your computer as powerful as the Hubble Space telescope. Try locking onto the moon and zooming in. Jupiter is another beautiful sight fully zoomed in! Once you zoom in all the way, you can see Jupiter’s moons. Combine these three tools for a treat: lock on Jupiter, zoom in all the way, and start a time-lapse and you’ve just recreated Galileo’s world-shattering scientific observations. Earth’s orbit combined with daily rotation means that a day isn’t really a day. There are actually two types of day on earth: a normal day where we see the sun appear in the same part of the sky 24 hours later and the sidereal (pronounced “sye – DEER – ree – all”) Use the option key to jump by sidereal time instead of “normal” time. This is an advanced technique to explore as you get more comfortable with the other tools. The choices of the type of “mount” are equatorial (what we think of as “normal” view) or “azimuthal” (the way some telescopes are angled). The azimuthal mount can sometimes highlight certain types of sky motions better than the equatorial mount. Mount switch – Command/Ctrl + M changes the type of angle you are at when viewing the sky. Stellarium is a deep and complex software tool that will improve your Physical Astronomy observations. I’ve shown you how to control time, lock on an object, zoom, and see the sky at different angles. These are just a few of the controls available. I trust you will have fun. If you have any questions, just contact me and I’ll be happy to chat. 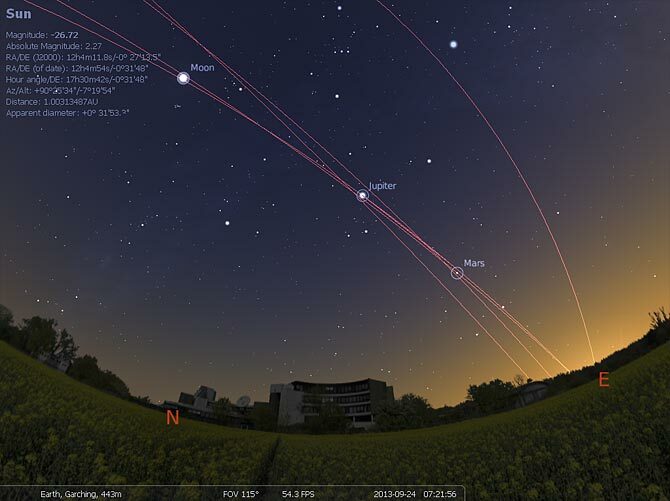 Thank you for sharing this tutorial on Stellarium! It was very helpful.